I have an Orion 8" F/4 astrograph. This will be used exclusivity with an ASI1600mm camera, OAG, and filter wheel. I also have the Skywatcher "quattro"4-element coma corrector. I've been doing a lot of reading here on the forum and I still don't quite understand what the "best" method would be to collimate the scope. For instance, should I offset the secondary and if so should it be in one direction or two? What effect does the CC have on illumination of the field at the camera and does this affect the offset? Any tips and insight are greatly appreciated! If the Orion scope is the same as the Astro-Tech 8" f/4 scope the offset is built into the secondary spider. Collimate the scope without the coma corrector. See the link below. 4 (mandatory) an autocollimator to eliminate all the residual errors after steps 1-3. How do I identify if the secondary is "built in"? I have ordered the astrosystems short 2" combo tool. I also have a laser and barlow I use for the primary alignment. 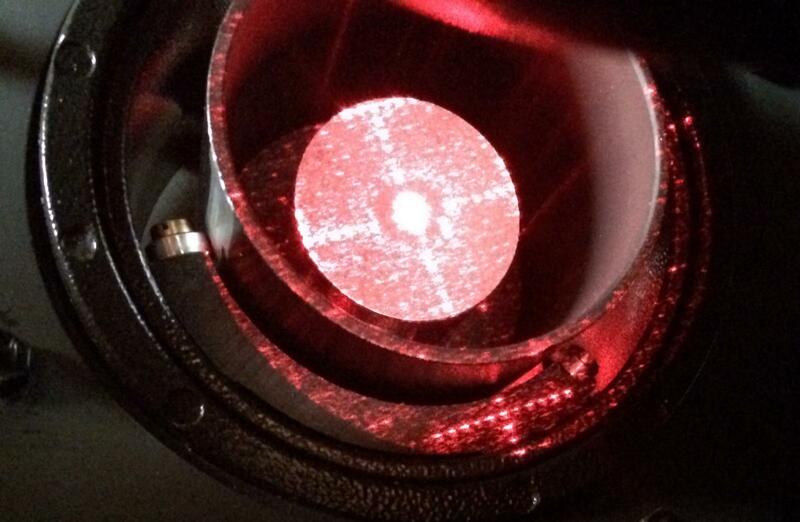 As for the autocollimator, I would need an extension tube as well to reach the focal plane? Catseye autocollimators are available with built-in extensions to match the scope. Order the length you need. Call Orion Tech Support and ask. Looking down the tube the offset is easily seen. A crude measurement gave me about a 5mm offset away from the focuser. The way the secondary is attached to the stalk I believe result in the mirror also offset towards the primary as well. As an owner of several Newtonian design OTAs in apertures from 6" to now 12" in FL from F6 - F4 I can tell you... Forget trying to properly and accurately collimate the shorter focal length with just the standard cheap tools. The larger the aperture and the shorter the FL the more accurate your collimation tools HAVE to be. Pretty much forget trying to use a standard cheap or even dolled up laser. You will need to see and correct a lot closer than a laser can possible do on its own. Lasers themselves also must be properly and accurately collimated to even begin to get the job done "somewhat" accurately. The secondary mirror in truth when in the size range of the short focal length secondary diagonal mirrors can be turned slightly "out of round" to the Primary and the focuser tube and a laser will show centered collimation. There are methods of using a "barlowed" laser for collimation that are a way to get much better accuracy from a laser collimation. It can be a little complicated for new users and if not done strictly right can still not properly collimate a large aperture short focal length Newtonian OTA. For a Cheshire collimator if you have the faster F4 & down FL from 8" (200mm) and above OTA then your Cheshire needs to be a native (not 1.25" "adapted" to 2") 2" visual collimator. 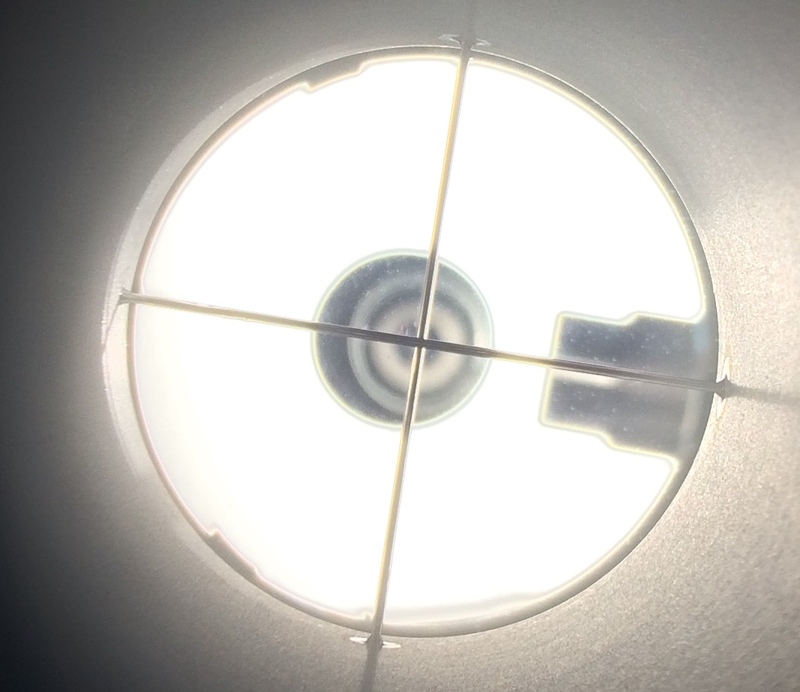 The 1.25" - 2" cheshire adapter is just one more place for slight misalignment errors to occur... remember on larger aperture/shorter FL OTAs even a slight mirror error can be detrimental to you end game collimations. Right here Starman1 has nailed it, forget the cheap 1.25" lasers, Cheshire & such "collimators", get something proven and made to do the right job on mirrored optics. The Cats Eye Teletube can quickly guide you to the proper offset for your secondary and spider... I've owned 2 Orion Newts an 8" F5 & a 10" F3.9... neither one had a built in offset in the secondary spider, but they were setup that way via the spider adjustment nuts and threaded studs on the ends of the spider vanes as well as the actual secondary initial alignments via the center adjustment screws. The spider and the secondary setup can both be adjusted or changed using those nuts & screws (most of the time erroneously so by the "new" Newtonian owner). If used correctly, which isn't hard, the Cats Eye 2" Comboset XLKP Kit can help you to get -everything- quickly and accurately aligned and collimated, but do spend a little time first understanding the whole offset thing... In your 8" its not much at all and can usually be corrected out with secondary till adjustments. Do a "Google" on "Newtonian secondary offset" to find a boat load of instructions and answers. Once you drop the Cats Eye Tele-Tube in the focuser in the proper instructed setup turn it to run parallel to you spider vanes you will see quickly your spider offset from center against the cross hair of the Tele-Tube. Same on using the secondary collimation and center screw to do an offset that way (the best way IMHO). Here is just one of the many images I have taken of my 10" F3.9 Newt at collimation via the Cats Eye System. If you own Newtonians and want "perfect" collimation fairly quick its the way to go once you learn how to use the setup. You do not have to change out your Primary center mark either... I do this with the correctly centered marker I placed after the refigure years ago... Its on of those "ring hole reinforcement rings" and it works with the Autocollimator just fine. Edited by The Mad One, 07 February 2019 - 10:54 AM. I got the catseye 2” combo tool. Also borrowed a good quality 2” holographic laser. I did my best to locate the secondary concentric to the sight tube, both into/out of the tube and rotation. Put the laser in and tweaked the secondary tilt to center the laser in the primary doughnut. I then adjusted the primary to bring the shadow of the doughnut to be concentric with the bottom of the laser face centered on the hole where the laser emits. 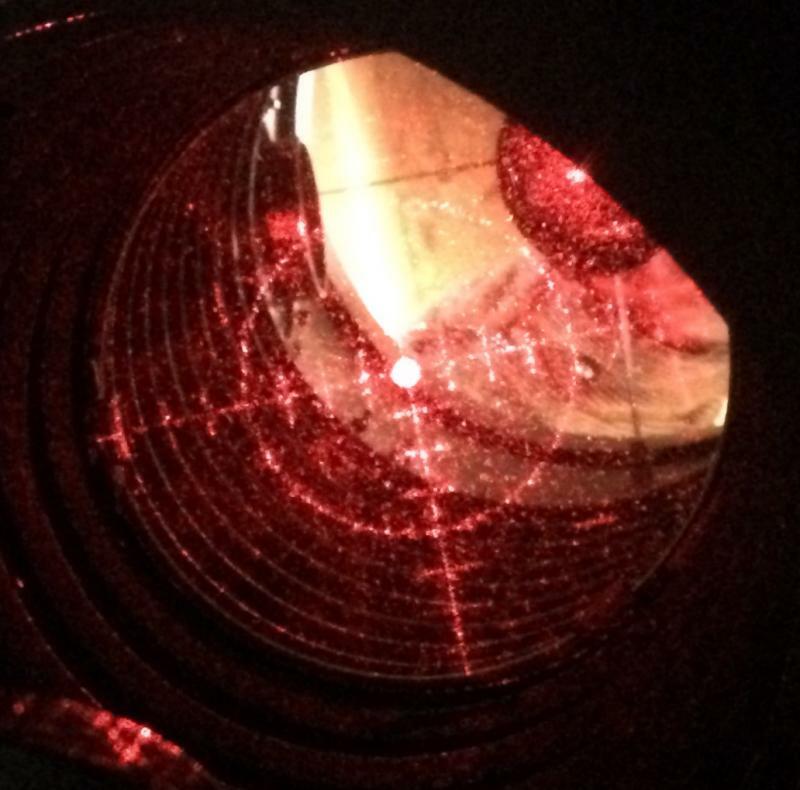 I took some photos and attached to this post of the view from the peep-hole and of the laser. Any feedback would be appreciated! It's also easy to see when you're collimated with the barlowed laser technique. All of which illustrate what you'd see with a barlow in place. However, with your laser, the dark shadow is visible anyway, which means a barlow is unnecessary. with the coma corrector in place. I have a 1.25" laser, Orion "deluxe" I believe. The laser itself is collimated but I've discovered the 1.25"~2" adapters I have are not true. The laser describes a circle on the primary when rotated in the focuser. The 2" laser I borrowed is spot on when rotated in the focuser. I do have a 1.25" "shorty" barlow. Perhaps I can get an adapter that runs true but I'm not sure If I can see the bottom of the shorty barlow in the tube. For the barlowed laser, does registration even matter if you're centering the doughnut shadow on the bottom of the barlow? When I took the picture through the Catseye, I rotated the combo tool so the cross hairs where "over" the reflection of the spider vanes. The dark offset circle in the picture, is that the shadow of the secondary? It's not concentric with the other things in the picture, but offset towards the primary. I assume this shows the proper offset is "built in" to the secondary when the secondary was mounted to the stalk? 1) the registration of the laser in the barlow is unimportant, but the registration of the barlow in the focuser is critical. 2) the offset shadow of the secondary results from collimation, regardless of whether the secondary is offset on the stalk. You'd see the same secondary shadow offset in a collimated scope even if the secondary was centered in the tube. With an offset secondary, the optical axis would coincide with the centerline of the tube. With a centered secondary, the optical axis would tilt toward the focuser a tad. But the results of collimation would be the same--an offset shadow of the secondary. I see Farpoint has a stepped laser, with both 2" and 1.25" steps. Do you know if the shorty 1.25" barlow can be attached to the 1.25" step on the laser and the laser then inserted into a 2" focuser? Yes, it can as long as the thumbscrew does not stick out too far.